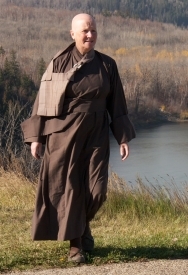 Some years ago a fellow monk was given a car which involved a lengthy trip in order to pick it up. She was reticent about going. A friend advised her simply. Don’t let the thought of the journey put you off going! For the next ten days I’ll be traveling in Washington and Oregon, by early July I’ll be in Idaho. At times during the past week making the arrangements for this trip have become overwhelming. Thankfully there have been opportunities to walk in the forests around here and to spend time with fellow monastics and lay friends too. There were so many details that needed to be dovetailed together, so many variables to juggle. Thankfully the thought of this trip has not put me off making it! I’ve recycled my friends advice many times over. It has become something of a mantra, Don’t let the thought put you off. Tomorrow I’ll be driven to Seattle to catch a ferry to Bainbridge Island. It will be a 40 minute crossing and I’m told I might just see a whale, but at this time of year it’s more likely you will see sea lions or seals. And possibly a Dall’s porpoise, which looks like a miniature Orca. There may be another more lengthy ferry voyage next week and, if all goes to plan, a very interesting visit which I’ll write about. Already the mental gymnastics of the past days are fading. It sounds not unlike the traveling salesman problem, which you’ll be pleased to know is classed as ‘NP-hard’. “The traveling salesman problem (TSP) in operations research is a problem in discrete or combinatorial optimization”(Wikipedia). NP-hard or not, sounds like you have a solution! Enjoy the journey. …what the NP stands for? Or is that question better left be. Thanks Walter I will enjoy the journey. So far so good. I can hardly believe I left England a month and a half ago. For some reason the series called the Rise and Fall of Regi Perrin is coming to mind. Could you find a link to that TV series for me Walter and post it in a comment. Wikipedia would have a run down on it I expect. I’m down to the wire getting away this morning and still I’ve not pulled the sheets off my bed and obviously my computer is still up and running. I’ve been using my cell phone as a modem to connect to the Internet, slow connection.